The Royal Society’s dispassionate summary of the potential benefits and risks of planting crops of GM forage for farm animals to feed on makes for interesting reading, thought its lack of recommendations on a way forward for GM in New Zealand may leave you wondering what the message from science actually is. At the Science Media Centre we held a briefing today for journalists, featuring three of the co-authors of the paper. You can listen back to their presentations and the Q&A with journalists at the end here. Bottom line is that the scientists believe that after 10 years of intensive farming of GM crops around the world – 143 million hectares of GM crops were planted last year alone – the overwhelming scientific evidence suggests that genetically modified crops are safe to grow and consume. But that hasn’t really seen industry and public perception of genetically modified organisms shift dramatically in favour of the technology being used. As Lincoln University’s Caroline Saunders pointed out in her presentation, opposition to GM at an industry level is on the increase in the US and the European Union where the high-value premium sectors of the market are anti-GM, because animal meat reared on GM crops often sells for less. As an example given by Professor Saunders, she points to GM corn-fed beef going for eight per cent less than its non-GM equivalent. Research also suggests that what consumers are willing to accept when it comes to GM is complex – if GM traits make food healthier or reduce the impact on the environment they are more accepting of it than if GM traits reduce prices. Some New Zealand research referenced by Professor Saunders suggests a fairly high level of rejection (40 – 45 per cent of those surveyed) of products with beneficial GM traits, say butter with less cholesterol or insect resistant sweetcorn. As such, whatever justifications scientists can put forward for genetically modified crops, in this case, GM forage crops, won’t necessarily hugely influence whether consumers are accepting of it. There was much discussion in the briefing of the difference between cisgenic and transgenic modification, which guest blogger Jack Heinneman recently examined in a series on Sciblogs. Pastoral Genomics’ Dr Michael Dunbier outlined the reasons for pursuing research into GM forage crops (see his presentation below). One striking image he put up on his slide shows GM ryegrass engineered to be drought resistant. The plants are visibly much better off that those unmodified plants. But if many scientists are keen to get moving here on GM crops most are realistic that due to the issues mentioned above, a commercial release of a GM forage crop which could become the basis of feed for millions of cows and sheep, is still some way off. In Dr Dunbier’s estimation, the earliest commercialisation could be in 2017 – 2018. An NZPA report on the briefing. Peter you describe the Royal Society of NZ (RSNZ) report as a “dispassionate summary of the potential benefits and risks of planting crops of GM forage for farm animals”. BUT, Dr. Goldson, the principal author of this report and the RSNZ spokesperson, is ALSO the Chief Scientist of one of the companies wishing to commercialize GM ryegrass! Does anyone else think that this is a bit too cozy? How has the RSNZ achieved objectivity in this matter? Isn’t the RSNZ worried that it is behaving as the public relations agency for the companies hoping to commercialize GM ryegrass? RSNZ is a statutory body required to objectively advise the public on science and technology. It is clear that Dr. Goldson should not have been in a position to speak for the RSNZ on this matter. Moreover, his conflict of interest was not even declared in the report. How can I and my fellow citizens reach an informed judgement about GM ryegrass if we can’t trust the Royal Society of NZ? openscience, the paper is peer-reviewed so its not Stephen Goldson pushing his own opinion – look at the number of contributors and reviewers. Actually, its clear from the paper that they are bending over backwards to stay neutral on the subject. Last year the Royal Society of London came out quite strongly in a report recommending GM technologies be pursued to tackle likely future food shortages. This paper doesn’t go anywhere near as far as that – no recommendations are made. It’s simply an analysis of the current situation. So I think the RSNZ is taking this seriously, is serious about getting a wide range of views and is trying to be impartial. Sure Stephen Goldson works for Agresearch, but most of the CRIs and universities collaborate on some level on this type of research, so what do you do? Exclude from the debate the scientists who know this stuff the best or get their input and put it out to peer review? It might be useful for the term â€˜peer-reviewâ€™ to be discussed. In the world of science publication, it almost exclusively means that an editor with expertise in the field and independent of the manuscript reviews comments from (usually anonymous) referees and then makes a decision to publish, publish after revision, or reject. The anonymity of the referees means that they can truly speak their minds. Importantly, though, the editor is independent of the manuscript. The editor has a vested interested in maintaining trust in his/her journal and thus would be less likely to risk pushing through a one-off paper. The only other â€˜peer-reviewâ€™ model that I have seen is one in which the refereesâ€™ comments are published with the article. This also was not done here. In this case, it appears to me that the author(s) was in full control of the comments and could directly influence the decision to publish. The author(s) effectively was also the editor, or closer to being an editor than would be the normal case with a science journal. The author(s) is powerfully connected making it potentially problematic for referees to speak their minds. When the clear majority of listed â€œreviewersâ€ are directly linked to the consortium with commercial aspirations for GM ryegrass, or indirectly through joint funding, it is hard to see how this process meets a standard that most of my colleagues would call true peer-review. I have seen regulator agencies and other agencies use the term peer review to describe other processes, but these processes are, in my opinion and clearly in the opinion of the major science journals, not the same. Before using this term it might be worthwhile to distinguish between processes because it seems to me that far less rigorous processes are borrowing credibility from the most rigorous application that most of us know as blind review. While I donâ€™t necessarily agree, I take your point that our expert community is small and it is hard to source those without vested interest in the outcome. However, if we find it impossible to maintain a science community large enough and diverse enough to meet our needs of expertise without vested interests, we must simply declare the potential conflicts of interest, in big bold letters, or risk the process looking like an attempt to not acknowledge conflicts of interest. Interestingly, many of the top science journals are now requiring authors to do just that. In this case, the declaration would probably have to extend to the review process as well. Do you know that the process was different than what it appears to me to have been? If so, could you let us know? In the meantime, I share the concerns expressed by Openscience. Jack, in a practical sense I think it means subjecting the work of an author to the scrutiny of a range of experts in the same field. That’s what I meant by peer-reviewed anyway. Is the peer review of the RSNZ emerging papers as robust as those of say, the RSNZ journals? I don’t know. I have no visibility into the process, I’m just taking it on face value judging by the contents of the paper themselves – which seem very measured and balanced, and the list of reviewers and contributors. What I haven’t seen yet is some analysis of the paper itself from an expert in the field, which would be useful, and which Sciblogs could certainly accommodate. Peter – I’m with Jack and openscience on this. I am also concerned the RSNZ is so easily led astray from an impartial position; perhaps due to the weight of opinion from within its ranks. Jack – you state: “scientists believe that after 10 years of intensive farming of GM crops around the world” Follow this logic yourself for just a minute!… really? should something be considered safe after 10 years of extensive use? There is genuine and legitimate concern around GE tech. A key issue is that it is very difficult to conduct real independent research to verify claims or asses issues such as safety. Firms such as Monsanto OWN the rights to their seeds and PROTECT THEIR COMMERCIAL interest – including specifying the terms under which research is carried out on their PROPERTY. The commercial incentives here heavily line up on the pro-GE agenda, and the pro-GE lobby also has huge political influence. This is the opposite to climate change, where the fossil fuel industry has the commercial incentives and the political influence. We have all seen what happens when the forces of commerce oppose the scientific perspective – but what happens when commerce and a reductionist scientific perspective aligns? You then have the overwhelming forces of ‘science’ (aka reductionist science) and commerce vs an integrated systems science perspective. Of note is that climate science is increasingly multi-disciplinary and systems focused, whereas GE science is still very reductionist. Also relevant to climate change is that the RSNZ stance on GE could undermine its position of integrity on climate science. Additionally it does not take 1000’s of years of conventional breeding to produce results – IGER in the UK have conventionally bred grasses in 10 or 20 years – about the same as it looks to take for the GE stuff. However the economics are quite differnet in that a GE firm such as Monsanto in OWNING a strain are able to control and therefore receive more of the economic benefit, whereas IGER are not given the same legal rights for their R&D efforts. For example a farmer can breed store and reuse his own IGER developed seed, but cannot do the same with Monsanto GE seed. Therefore there is also a clear incentive for Agresearch (a profit motivate CRI) to be developiong and justifying GE grass over conventionally bred grass. For these reasons I think your position in heading this report, and RSNZ’s position in backing you to head it are untenable – your conflicts of interest – and as Jack points out the ‘peer reviewers’ need to be stated, and RSNZ need to work to clarify their association with it before it undermines there impartiality and credibility. 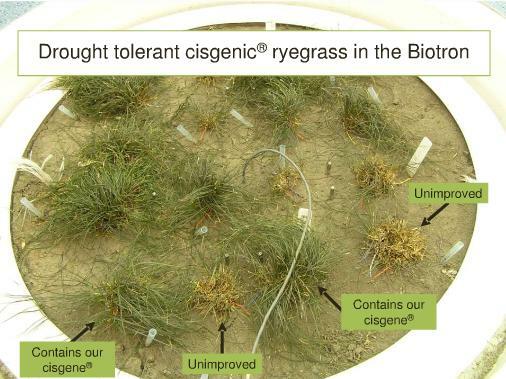 Additionally it does not take 1000’s of years of conventional breeding to produce results – IGER in the UK have conventionally bred grasses in 10 or 20 years – about the same as it looks to take for the GE stuff. However the economics are quite different in that a GE firm such as Monsanto in OWNING a strain are able to control and therefore receive more of the economic benefit, whereas IGER are not given the same legal rights for their R&D efforts. For example a farmer can breed store and reuse his own IGER developed seed, but cannot do the same with Monsanto GE seed. Therefore there is also a clear incentive for Agresearch (a profit motivate CRI) to be developing and justifying GE grass over conventionally bred grass. For these reasons I think Goldson’s position in heading this report, and RSNZ’s position in backing him to head it are untenable – his conflict of interest – and as Jack points out the ‘peer reviewers’ need to be stated, and RSNZ need to work to clarify their association with it before it undermines there impartiality and credibility. Peter â€“ Iâ€™m with Jack and openscience on this. I am also concerned the RSNZ is so easily led astray from an impartial position; perhaps due to the weight of opinion from within its ranks. Peter â€“ you state: â€œscientists believe that after 10 years of intensive farming of GM crops around the worldâ€ Follow this logic yourself for just a minute!â€¦ really? should something be considered safe after 10 years of extensive use? There is genuine and legitimate concern around GE tech. A key issue is that it is very difficult to conduct real independent research to verify claims or asses issues such as safety. Firms such as Monsanto OWN the rights to their seeds and PROTECT THEIR COMMERCIAL interest â€“ including specifying the terms under which research is carried out on their PROPERTY. The commercial incentives here heavily line up on the pro-GE agenda, and the pro-GE lobby also has huge political influence. This is the opposite to climate change, where the fossil fuel industry has the commercial incentives and the political influence. We have all seen what happens when the forces of commerce oppose the scientific perspective â€“ but what happens when commerce and a reductionist scientific perspective aligns? You then have the overwhelming forces of â€™scienceâ€™ (aka reductionist science) and commerce vs an integrated systems science perspective. Additionally it does not take 1000â€™s of years of conventional breeding to produce results â€“ IGER in the UK have conventionally bred grasses in 10 or 20 years â€“ about the same as it looks to take for the GE stuff. However the economics are quite different in that a GE firm such as Monsanto in OWNING a strain are able to control and therefore receive more of the economic benefit, whereas IGER are not given the same legal rights for their R&D efforts. For example a farmer can breed store and reuse his own IGER developed seed, but cannot do the same with Monsanto GE seed. For these reasons I think Goldsonâ€™s position in heading this report, and RSNZâ€™s position in backing him to head it are untenable â€“ his conflict of interest â€“ and as Jack points out the â€˜peer reviewersâ€™ need to be stated, and RSNZ need to work to clarify their association with it before it undermines there impartiality and credibility. Hi Peter – sorry – rushing a biot and not editing thouroughly! the last one should be ok!